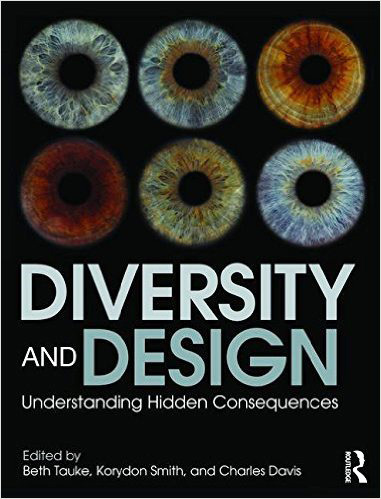 I am happy to announce the publication of a new co-edited book on Diversity and Design. This effort began almost ten years ago with an interdisciplinary course in the humanities offered to undergraduates of all majors at the State University of New York at Buffalo. Beth Tauke, Associate Professor of Architecture and Associate Dean of the School of Architecture at SUNY Buffalo initially put this course together. Making use of invited speakers each year, she provided a broad analysis of the affect of diversity on design case studies throughout time. I was invited to give lectures on race and architecture from any historical period or style, which led me to talk about topics ranging from racial segregation at Thomas Jefferson’s plantation Monticello to the integration of race and geometry in Colin Rowe’s theory of collage urbanism and the racial politics of memorial design on the National Mall in Washington, D.C. After a number of years giving guest lectures, Professor Tauke asked me to collaborate with her and a previous classmate of mine to put together a textbook that could be used by others to teach a diversity course in design. The entire premise of the book is simple: we decided to think of design as a form of social praxis (direct engagement), which establishes the basis for interpreting how design affects social conditions and cultural meaning (and vice versa). A major goal of the text was to write for a general audience (i.e. no discipline specific jargon) and to use physical case studies to make things empirical for uninitiated readers; the course taught at SUNY Buffalo was a general education class, although many design students signed up for it annually. There are 15 chapters to accommodate the 15-week I contributed to the diversity sections of the introduction and conclusion, curated the ‘Race and Ethnicity’ section of the text and wrote chapter 1. It was very useful to work with people I trust and respect as there will inevitably be occasional disagreements and divergences of opinion. We ended up with a very substantive and beautifully illustrated volume that will be a useful tool for educators at all levels. There are a few noteworthy senior scholars that contributed to our text, including the landscape architect Walter Hood, architect Kathryn Anthony (known for her work on sexism in design studios), Sina Mossayeb of IDEO and award-winning architectural historian Despina Stratigakos. Beth Tauke and Korydon Smith both work in the field of universal design, which examines issues of access broadly considered from handicap accessibility to race and class exclusions in the public sphere. I was very impressed with an essay written by graphic designer and artist Mark Addison Smith of the City College of New York, whose creatively addressed the issue of homophobic graffiti in bathroom stalls. I believe that Lynne Horiuchi’s essay on the architectural ethics of Japanese internment is quite original and innovative and Peter Wong’s essay on historical Lilong architecture–now endangered by China’s stratospheric economic development–is quite timely. You can find a brief description of this text here and you can purchase it on amazon. I will be using this text to teach a course in the spring of 2016, so perhaps I’ll post an addendum sharing the pros and cons of its current structure. (One con I can think of is a glossary section that had to be eliminated because of time and space…) Regardless, I hope that this resource will prove helpful to those interested in socio-cultural issues of design and the built environment. And of course, if you get a chance to read it I would appreciate some helpful comments on this blog and/or my email address.